Joe Scanlan became known in the 1990s due to his very particular appropriation of Conceptual art, exploiting two main registers: display on one hand, designating the artwork as a consumable product, DIY on the other, advocating the mobility and adaptability of objects, even their reversibility depending on contexts and usages. Scanlan's work turns out to be reversible. A shelf can appear to be a minimal construction and be used as a shelf, as implied by functional logic. The technical simplicity of Scanlan's realizations purposely leaning towards low-tech, with subsidiary possibilities for most of them to be de-installed and stored with no difficulty, convey something practical (art can be concretely useful) and aesthetic (each one of the artist's creations carries a specific function but also has its own plastic qualities) in the work. Thus Joe Scanlan's practice involves strategies that question the market and the value of a work of art. Extremely surprised by the attitude of students who are already wooed by galleries while they are still training, he invents Donnelle Woolford, a fictional artist he launches in the art world (with exhibitions, press articles, CV, facebook page, etc.). Beyond the conceptual aspect of his work, his approach focuses on the ephemeral nature of things, objects, lives. The artist's recent research, into the production of snowflakes or reconstituted forsythias, reveal his constant interest in what is transitory or ephemeral. This poetic tendency is becoming more and more present in Scanlan's work which always combines critical and independent standpoints. Joe Scanlan became known in the 1990s due to his very particular appropriation of Conceptual art, exploiting two main registers: display on one hand, designating the artwork as a consumable product, DIY on the other, advocating the mobility and adaptability of objects, even their reversibility depending on contexts and usages. Scanlan’s work turns out to be reversible. A shelf can appear to be a minimal construction and be used as a shelf, as implied by functional logic. The technical simplicity of Scanlan’s realizations purposely leaning towards low-tech, with subsidiary possibilities for most of them to be de-installed and stored with no difficulty, convey something practical (art can be concretely useful) and aesthetic (each one of the artist’s creations carries a specific function but also has its own plastic qualities) in the work. 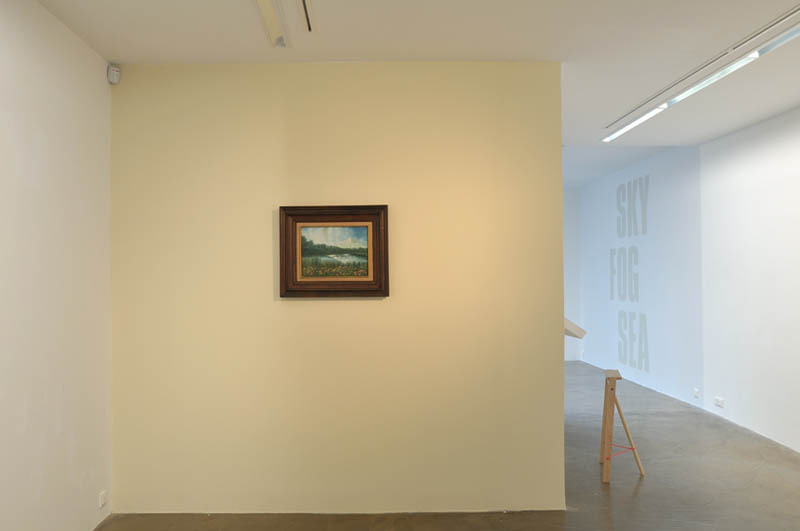 Thus Joe Scanlan’s practice involves strategies that question the market and the value of a work of art. Extremely surprised by the attitude of students who are already wooed by galleries while they are still training, he invents Donnelle Woolford, a fictional artist he launches in the art world (with exhibitions, press articles, CV, facebook page, etc.). Beyond the conceptual aspect of his work, his approach focuses on the ephemeral nature of things, objects, lives. 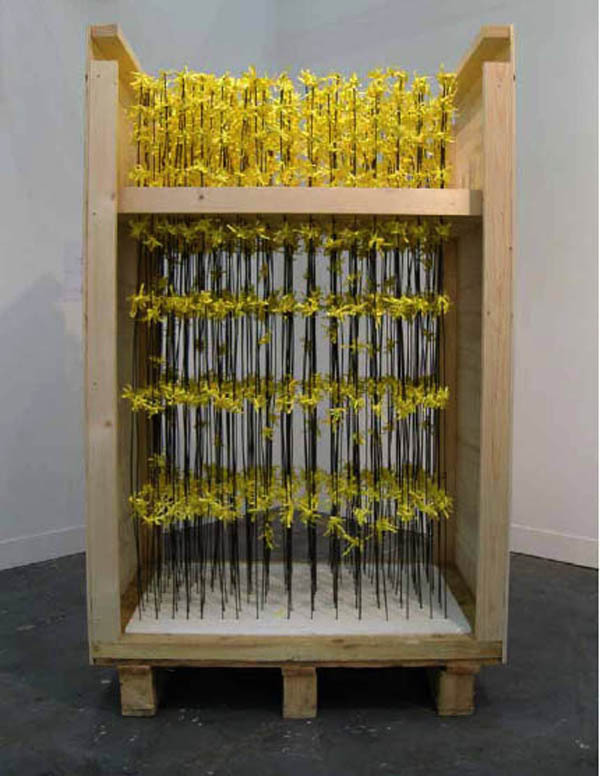 The artist’s recent research, into the production of snowflakes or reconstituted forsythias, reveal his constant interest in what is transitory or ephemeral. This poetic tendency is becoming more and more present in Scanlan’s work which always combines critical and independent standpoints.